In case you are a business traveller, please check the agreement with your current travel supplier carefully. Often you are obliged to use certain (more expensive) fares to be eligable for discounts. Choose for real savings, without any contractual obligations. Plan and book as far ahead as possible. This gives the biggest guarantee for good fares. Make sure your appoinments and plans are definate. Changing a ticket is often rather expensive. If possible, take the most common restrictions for cheap tickets into account: stay a minimum of 3 days or a night from Saturday to Sunday at your destination. 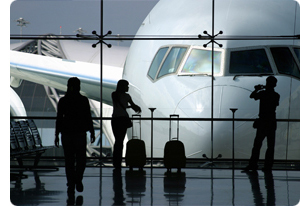 Inform us as detailedly as possible about your future travel plans. By combining appointments and trips, we can often realise considerable savings. If you travel frequently to the same destination, tickets starting at your final destination can also realise substantial cost benefits. On certain destinations, tour operators sometimes offer lower airfares in a package, in combination with a hotel booking or car rental. This is another way of saving on travel expenses.